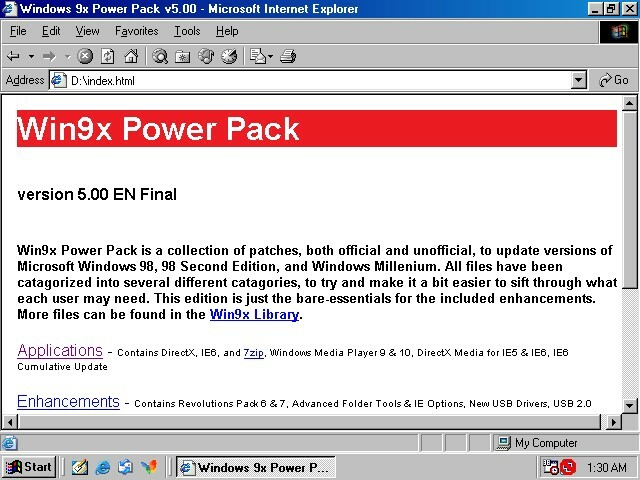 After a long, long time in development, and then re-development, I present to you Win9x Power Pack version 5.00 ENGLISH. If you have a broadband connection, be prepared to download about 180MB of files, which will extract to 190MB. You will be able to create an ISO file right from the build script, which is a feature that earlier releases could have benefited from. It's even easier to update now - take a look at the URLS files - they're plain-text files with URLS for files to download. Everything is nice and simple. Everything is scripted, and very little is asked of you when you use the build script. I've simplified the build script with several comments, so that future maintainers of the project can figure out how to modify the script to their needs. This release has taken a tour of the world, and has come back bearing gifts. 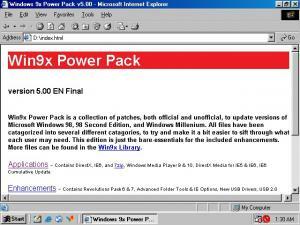 It is intended to update a Windows 98 First Edition, 98 Second Edition, or Windows Millenium Edition Installation. For some patches, you will need a license and installation media for Windows Millenium. The included Readme.txt and Changelog.txt files point out specifics. I've also included documentation for LameSkin, a free skinning engine developed by Tihiy for use in Windows 98 SE. More documentation will follow if there is a need for it. 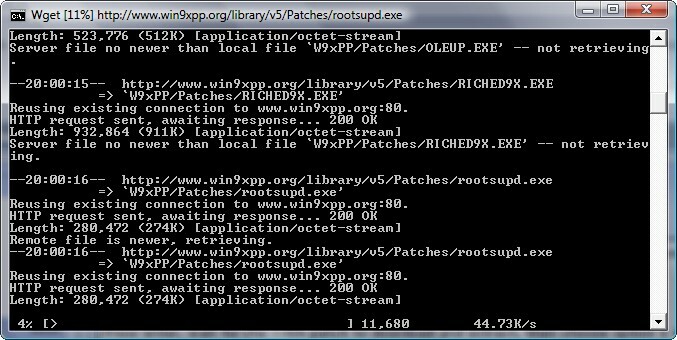 For now, grab the latest version here: http://www.win9xpp.org/library/w9xppv505.zip (797KB, ZIP), unpack this zip file to a free directory (Such as C:\W9xpp\), and run W9xBuild.bat. Press the number 1 at the prompt, and wait a while. When it is done, the script will return you to the main menu. Future releases will be released as a single 7zipped archive, and can be applied directly through the Build script's menu system. edit: New Patch released July 21st - v5.05! edit2: I'm working on v5.1, as of March 14th, 2008! Thanks for the PP 5.0 update. for all future PP updates, because it is already on the "sticky" list. A small patch has been released to offer Maximus Decim's IE6 Cummulative update v1.5e, which he released today. I've also updated the RP7MM executable on my server to reflect Tihiy's latest release. And you can patch your copy of W9xPP to the latest version by running W9xBuild.bat, and select the Update option. This option requires a 4KB download, versus the full base package's size of 739KB. After the 4kb download, you will want to run the Build option, so that you get the latest files into your package. This option will be automated in a future release. Link is broken. How do you update to the latest release again? I've released a new version to correct some broken files and various little bits that needed updating. This new version also adds the unofficial nVidia drivers that have been released for all nVidia GeForce cards. Wait a bit, and it'll be ready for use in a little while - the total patch size is approx. 20MB in size. 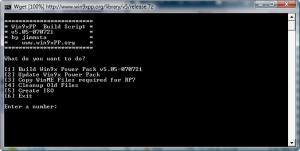 You can also grab a base version to build a new copy of the software off of, here- http://www.win9xpp.org/library/w9xppv505.zip. Follow the instructions in the original post for more info. Hey. I just came across this pack via referral to another unofficial support project. I have a computer with a dual-boot (via Bootmagic) of Win98SE, and WinXP Pro+SP2. I'm glad to have run into this site. Anyway, I just have a couple questions about this power pack. 2. Is DOS support still intact? 3. Is there a FAQ I can refer to for this? 4. Would it be possible to slipstream this into a Win98SE installation CD or will it have to be a seperate product to use? 5. Is that full download v5.05? The Power Pack is just a collection of patches. Nothing much more than that. It contains the Revolution Pack 7, and various other patches. It is considered to be a package for those in a hurry, or those that don't want to go through the stickys and grab the right files for their OS. It can also be easily updated through its W9xBuild.bat script. It is a separate product, intended for use on a separate CD from the Windows CD. I hope that I've answered all your questions. Just as a heads-up, version 5.10 is in development. I will be re-releasing the whole package once it is all ready to go. I'll update this thread with more info as it comes closer to completion. Please put in on a server which can support pausing and resumeing using a download manager.I have dial-up and want to download the full zip file and I started last night and made it up all the way to 93% but the downloadmanager crashed so I have to restart it. I'm not sure if I want to continue the project or not. I'm currently considering dropping the entire thing, as I really do not see a point to it anymore. In terms of people that are using Win9x, I've only seen 2 or 3 systems come into my shop with 9x over the past month, and those machines were dying. I do not think I'll be releasing a patch or anything in any period of time. I regretfully announce the death of this project. It's been a fun ride, but I've stayed my welcome, and then some. If anyone would like to take over the project, please feel free to contact me. Almost a month later, I've decided to continue the project, but I will be discontinuing the v5.x line in lieu of smaller packages for each individual 9x OS. This way, it should be easier to download for dial-up users, and shouldn't be filled to the brim with unneeded filler tools. returns "server not found" error. Also, if you wish, I can loan you space at my site to host your files, just e-mail me.